Have you ever restored a VM? Have you done your DR testing by actually doing a full recovery with AD? Did you find you had a couple odd things occur after restore, such as not being able to RDP into your recovered server? 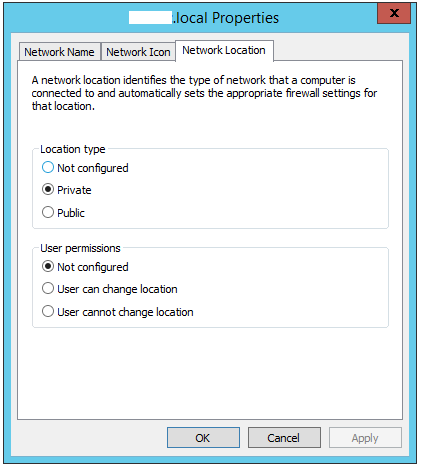 Chances are your network profile has changed to public, instead of Domain. This in turn causes certain firewall rules to trigger. I remember coming across this issue multiple times, especially when people usually want private instead of public and vice versa. So chances are you’ve come across this, telling you to use PowerShell cmdlet to change its setting, which to my guess makes a registry change. The other option they specified was to use the GUI. Well I find changing local security policies and all that other stuff rather annoying. Soo after a bit more googling I found a really nice answer, which worked and was very simple to implement. Very nicely written and easy to follow by a Evan A Barr. You can view his site here. 0) by adding a DNS suffix so that NLA can properly locate the domain controller. 1) Go to Network Connections. 2) Go to the properties of of the network adapter in the wrong location. 3) Go to the properties for IPv4. 4) Click the "Advanced..." button. 5) Select the DNS tab. 6) Enter your domain name into the text box for "DNS suffix for this connection:". 7) Disable and then enable the connection to get NLA to re-identify the location.